Love them or hate them, Razer is impossible to ignore. Despite a past reputation for producing gaming accessories with a bit more flash than quality, Razer has steadily released a number of well-reviewed products ranging from mousepads to gaming laptops and everything in-between. 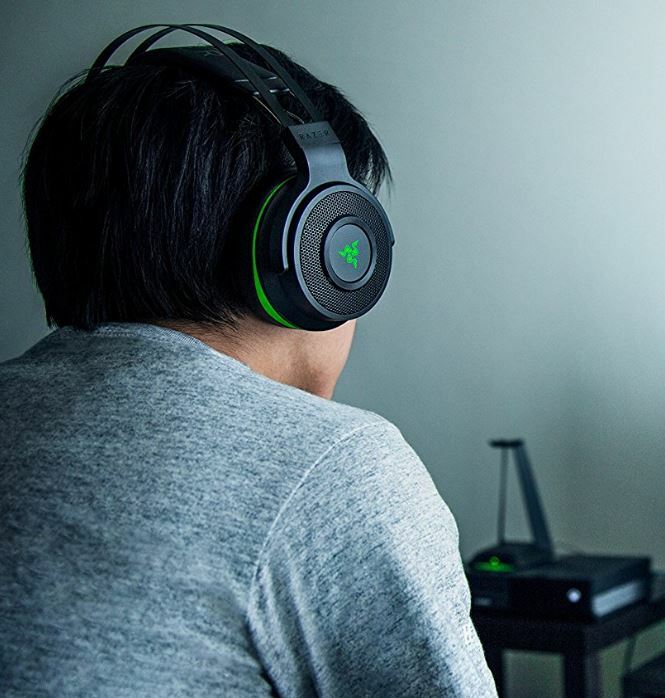 Though many of Razer’s angular lines and bold colors wouldn’t fit well in an executive boardroom, the company’s tagline, “For gamers, by gamers” carries through all their products. Razer clearly knows their audience and focuses on directly meeting the needs of gamers whether they play Xbox, Playstation, or PC. 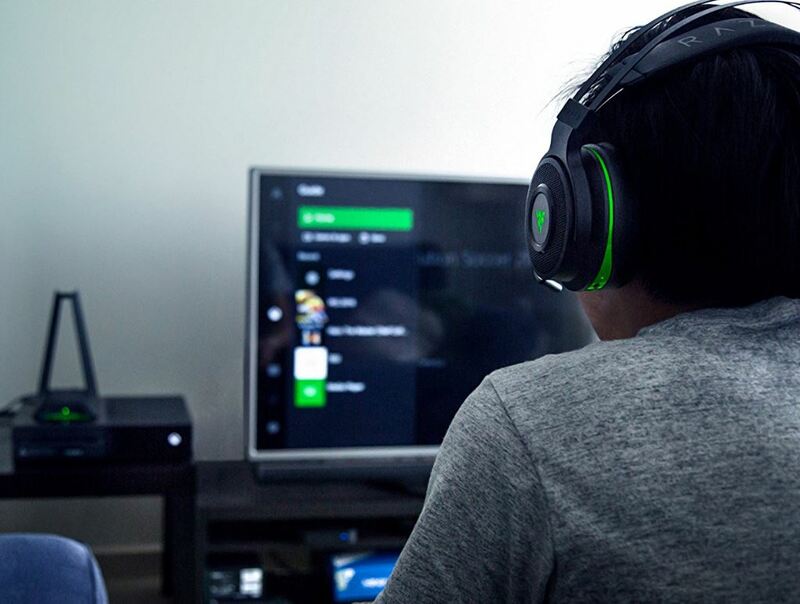 With the rise of online collaborative play, a quality headset is an absolute necessity for any serious gamer. Trying to communicate and coordinate with teammates during intense battles just doesn’t work if you’re trying to type on a keyboard. Trying to shout into a microphone while your entire team goes crazy listening to the echo of your speakers will get you booted off the team in no time. 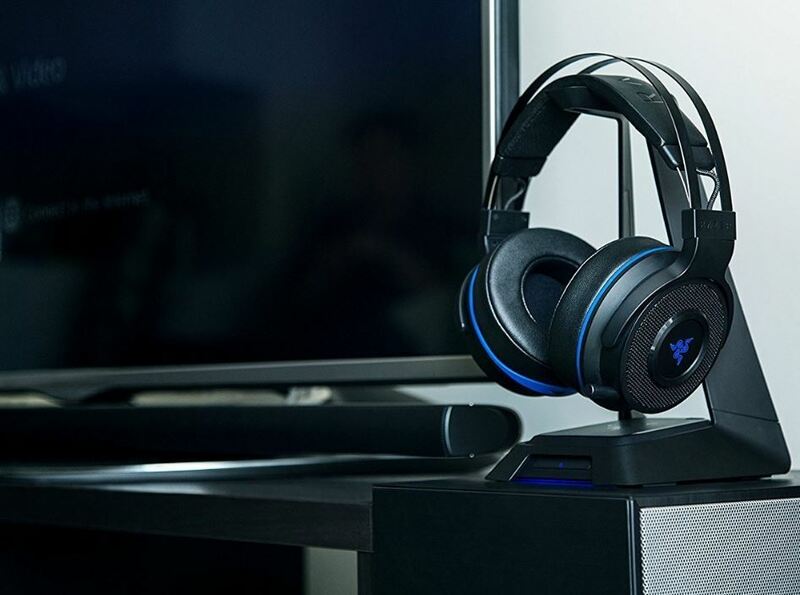 Razer releases their latest and greatest contender, the Thresher Ultimate 7.1 Wireless Gaming Headset. Let’s dive in and see if it hits all the right buttons for your gaming needs. Razer designed the Thresher Ultimate in two versions, one for Xbox and one for PS4. Both clad mostly in black, the Xbox version features green accents while the PS4 sports blue to match their respective consoles. While no separate design exists for PC users, both console versions also support PC connectivity. 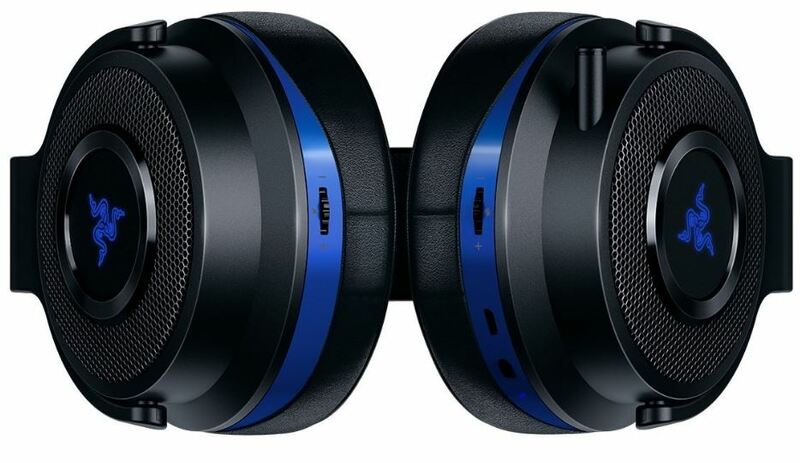 Stylistically, the mainly black headset has a very polished, classy look. The color-accented Razer logo and earcups do provide a splash of personality, but they certainly don’t come across as gaudy. Though we don’t think they’ll be on your radar unless you’re a gamer, you certainly wouldn’t look out of place bringing them anywhere. Knowing that gamers will wear headsets for hours at a time, Razer smartly chooses to focus a great deal of attention on the comfort factor. Weighing in at just 0.89 pounds, the Thresher manages to feel sturdy and well-constructed despite barely tipping the scales. Also, the comfortable head strap and leatherette over memory foam ear surrounds made us nearly forget we had them on even during extended listening. The retractable boom mic tucks neatly into the body of the headphones for a clean, distraction-free look when not in use. When the time comes to command your squad, simply extend the microphone for maximum voice clarity. We were especially impressed with one small but thoughtful touch from Razer. Foam indentations allow glasses to sit comfortably against your head. If you do wear glasses, you know all too well the struggle of trying to make headphones work without cramming the arms of your glasses against your temples. Including such a small but helpful design shows that Razer really does listen to the needs of gamers. While looks and comfort certainly matter, audio performance remains the core function of any set of headphones. Even though you should expect to use the Threshers for your next professional studio mixing session, Razer certainly hasn’t ignored audio quality in the design process. While the Thresher does not include active noise cancellation, the memory foam and leatherette ear cushion are closed and circumaural, meaning they completely surround your ears with a fully enclosed earcup. This helps to isolate outside noise and keeps your audio to yourself, which is immensely beneficial if you have roommates, sleeping children, or like to listen and play in public. Audio purists may prefer an open headphone for sound quality, but for real-world use for the rest of us, we’ll take the privacy and noise isolation any day. The headphones contain 50 mm drivers for powerful, accurate audio reproduction. The drivers have an impedance of 32 Ohms at 1 KHz and a frequency response between 12 and 28,000 Hz. This allows for full spectrum audio, from crisp highs down to a weighty bass. While true thumping bass requires a large subwoofer moving a lot of air, we found the Razer Thresher to hold its own with a rich sound comparable to other mid-range headphones. Additionally, we found the mic performed adequately while recording and during a Skype call. It may not be studio quality, but it got the job done just fine for a headset with richness and clarity. 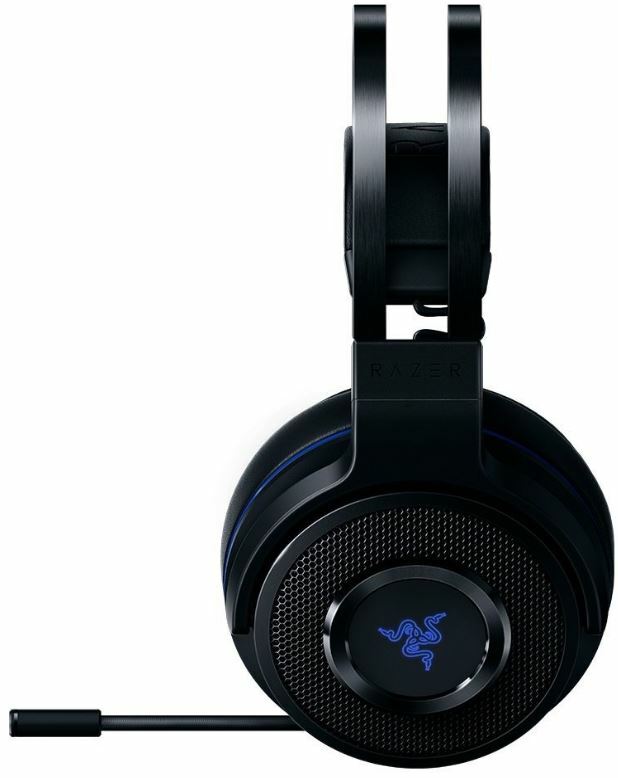 The Razer Thresher Ultimate 7.1 features Dolby Digital and Dolby Headphone technology. The Thresher gets the “7.1” in its name due to support for Dolby 7.1 channel surround sound. 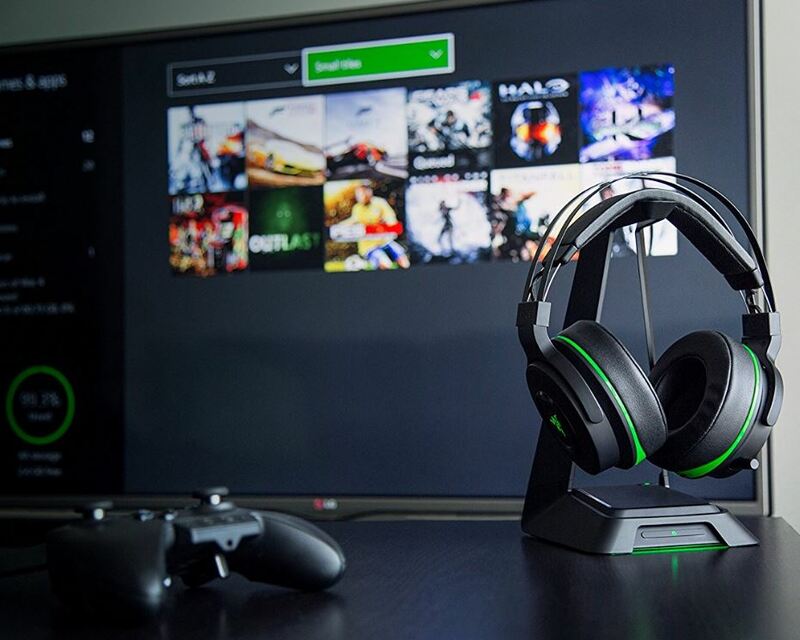 While this feature can enhance your gaming and listening experience, let’s clarify what it means and what it doesn’t. The number 7.1 refers to a specific speaker configuration. Seven speakers, a center channel, left and right front, left and right side, and left and right rear, combine with a subwoofer which contributes the “.1” to the designation. Surprisingly enough, true multi-channel 7.1 headphones do exist. Manufacturers do manage to cram multiple audio drivers in each earpiece. That said, the vast majority of surround sound headphones, including the Razer Threshers, use software controls to simulate the surround sound experience. The Threshers contains a single 50mm driver in each ear. Many people would argue that only multi-driver headphones deliver the true surround experience, and anything using software simulation is just faking. While we can’t settle that debate today, we can say that even with simulated surround, the Threshers still sound great. We found the audio crisp and clear testing with both gaming and music audio. The simulated surround does work to create a sense of direction and realism in games that you can’t possible experience with a standard two-channel set of headphones. We could distinguish sounds in front, to the side, and behind us, which accomplishes the primary objective of the surround experience. While positional audio may not matter in casual or real-time strategy games, you could benefit greatly if you play first-person shooters or role-playing games. Detecting the location of targets by sound alone gives you a great competitive advantage over other players who can only rely on visual cues. The Razer Thresher forgoes the common Bluetooth connection standard and instead uses 2.4 GHz wireless that connects back to a base station. Yes, 2.4 GHz, like your cordless home phone if you happen to still have one. Despite some advantages to Bluetooth, the decision to use 2.4 GHz makes a lot of sense. Most obviously, Xbox does not support Bluetooth headset connections. The Thresher’s base station connects to Xbox via optical audio connection. 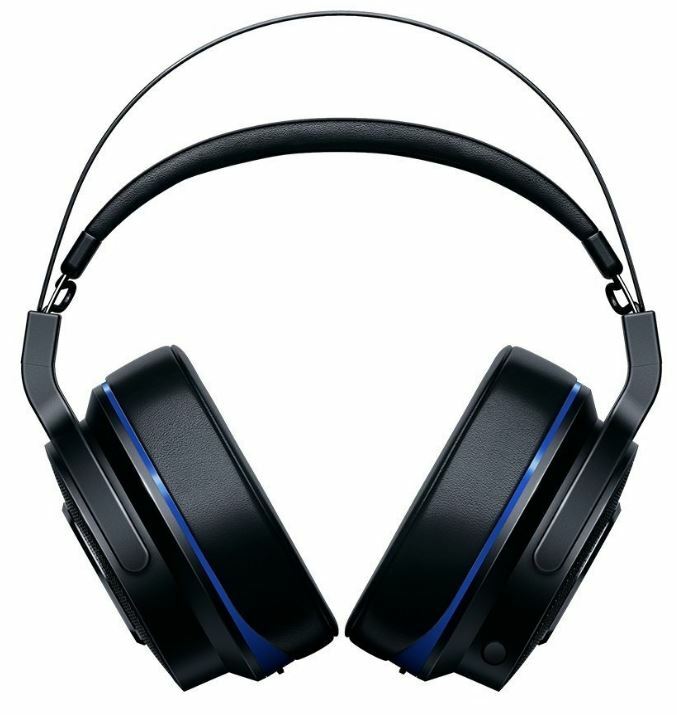 On the Playstation version, the 2.4 GHz base station remains even though Playstation does support Bluetooth headsets. Aside from streamlining manufacturing, this exists because each version of the headset also features PC compatibility. Switching Bluetooth pairing between multiple devices can prove slow and frustrating. Razer solves this problem by placing a small switch on the rear of the base station. As long as your gaming console and PC happen to be in the same room, this solution works extremely well. The only concern worth noting could arise if you happen to place the base station near another 2.4 GHz device. Most wireless routers use this frequency along with older cordless phones, so if you do experience any interference check for surrounding devices that could cause problems. No amount of comfort or quality matters if you can’t get through a gaming session without your battery dying fortunately Razer crammed a full 16 hours of battery life into the Thresher. Even better, a full charge only takes 4 hours. This should easily power you through even the longest gaming sessions. If you need to play more than 16 hours without a break, you might consider talking to someone about your gaming addiction. As another added convenience, Razer placed volume and microphone controls externally on the headphones. This allows for quick in-game adjustments without requiring you to stop gameplay and fiddle with Windows settings. The Razer Thresher Ultimate 7.1 could just be the perfect gaming headset. Razer clearly shows their years of experience designing gaming peripherals by checking every box a gamer could ask for. From more important tech features like 7.1 Dolby Surround Sound, down to minor comfort features like lightweight, comfortable ear cushions and foam indentation for glasses wearers, it’s clear Razer put a great deal of thought into every aspect of the Thresher’s design. Since even Xbox and Playstation players generally spend a good deal of time on a personal computer as well, the ability to instantly switch the base station between gaming console and PC really adds to the convenience factor. While Microsoft wants users to plug a headset into their Xbox controller, the dangling cord could easily get tangled or distract you at the worst possible time. The ability to travel up to 40 feet away from the Thresher’s base station wire-free is a huge step up. If you’re using standard two-channel headphones, you’re missing an important competitive advantage that 7.1 channel can provide. 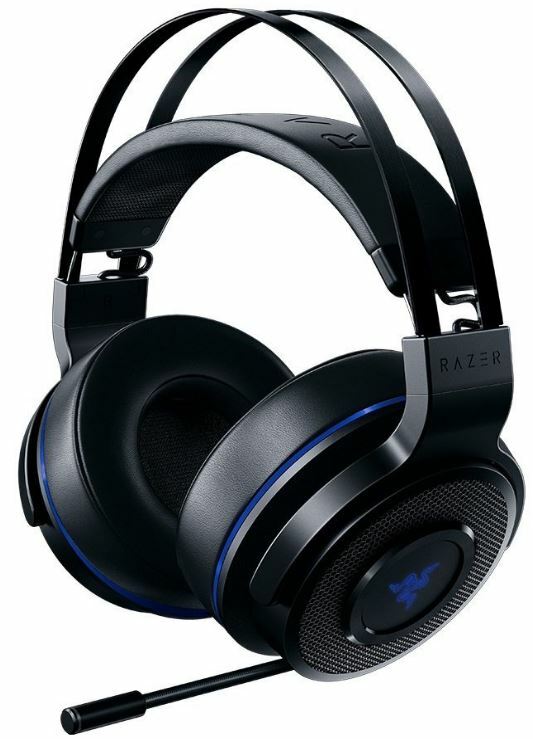 While that alone may convince many gamers to make the purchase, the Razer Thresher Ultimate gives you surround sound technology while also delivering in style, comfort, convenience, and audio quality. Razer clearly knows gamers. If you’re in the market to step up your headphone game, the Razer Thresher Ultimate should sit at the top your leaderboard.